Since 1960, Central Kentucky Community Foundation has served as a resource, leader, and catalyst for people who wish to make a positive impact on our community. In this spirit, we are thrilled to announce our newest endeavor: The Home of Philanthropy. Establish a permanent home to accommodate the growing work of CKCF. The capital campaign goal is to raise $1.3 million of the $3 million projected costs through philanthropy. With leadership contributions, along with other generous gifts from community leaders, the capital campaign has now surpassed $500,000 raised. Will you join us as we build our community’s new Home of Philanthropy? 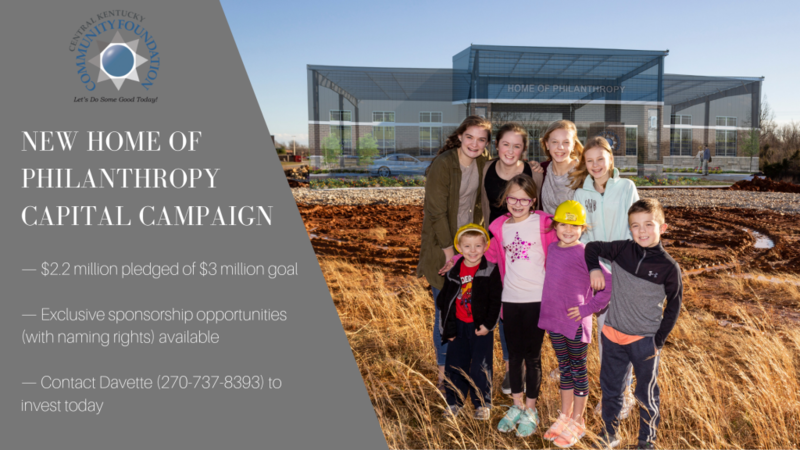 Learn more by viewing our Home of Philanthropy renderings and a list of our partnership opportunities available now. We can only build this new home for our community with the generosity and support of many. Please make your commitment today! Make a gift online, or contact Davette Swiney (dswiney@ckcf4people.org or 270-737-8393), President and CEO, about how you can become a sponsor and make a difference. Home is where the heart is, and this Home is where our heart will reside and flourish: the heart of those making a difference—the heart of those determined to enhance and build the future of our community—the heart of those changing lives forever. Contact Davette Swiney or make a gift today.